Henry Ford is credited with making the first successful gasoline engine propelled vehicle in 1896. This car had a steel frame and ran on bicycle wheels which he dubbed the “Quadricyle”. He made and sold three and organized the Henry Ford Company in 1903. In 1908 they began producing more sophisticated and powerful autos beginning with the first Model “A”. The company introduced successive Models, the “N”, “R”and an “S”, all rather large and expensive. During this time the Henry Ford Company faced financiers issues and reorganized to become the Ford Motor Company. Fords engineers developed the famous “999”, a very successful race car. In 1909 the company introduced the Model “T” which contained many components developed for the “999”. The Model T was designed to be light weight, strong and simple. High quality vanadium steel was used for the frame and all stressed components making the vehicle strong and durable. Ford sent to his dealers a Model T front axle twisted in a corkscrew to demonstrate that they would not break. The frame and running gear and major components were essentially the same for all models throughout the 19 years of production. The Roadster, Touring Car, Coupe and later the Fordor and Model T pickups all used the same frame and engine. The 20 horsepower engine was innovative for the time in that it had a removable cylinder head on a one piece cast iron cylinder block which made manufacturing and servicing the engine much faster and simpler. This engine could drive the 1200 pound car up to 45 miles per hour. Contrary to popular thought, not all Model Ts were black. From 1909 through 1914 you could also get them in Carmine, Brewster Green, Gray, and Midnight Blue. For the years 1915 through 1925 they were available only in black. It is thought that black paint was cheapest and was the only paint that would dry fast enough to keep up with the assembly line. By 1926 paint manufacturers had developed fast drying Channel Green and Windsor Maroon. For 1927 Commercial Green, Channel Green, Drake Green, Highland Green, Phoenix Brown, Gunmetal Blue, Moleskin Brown, Royal Maroon, and Fawn Gray were also available. 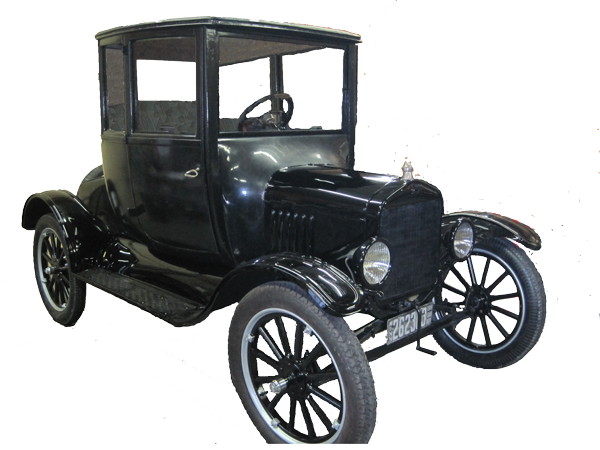 Ford slowly made improvements to the Model T over the years but they were mostly cosmetic. Magneto driven lights replaced the carbide and kerosene lights in 1913. An electric starter, generator and battery driven electric lights were optional accessories offered in 1919. In 1927 after making more than 15,000,000 Model Ts, production stopped to make way for factory retooling for production of the New Ford Car, the Model A. The alphabetical order was stopped with no “U” because Henry Ford wanted to make sure that the New Car was seen as really new. In 2015 the Model T still ranks third in the top ten most sold automobile in the US. An interesting article from the May 16th, 1936 issue of the “New Yorker” by American writer E.B. White, the author of “Charlotte’s Web”, “The Elements of Style” and other works can be seen here.